The cold weather of winter has kept us indoors and as a result, we’re all beginning to suffer from cabin fever. But with the promise of warmer weather as Spring approaches, it’s time for us to celebrate this season. Here is just a one party suggestion to help you celebrate with friends and family. but also be sure to tie in your theme by incorporating cheese umbrellas, rainbow fruit kebabs, rainy day cupcakes, and April shower cocktails. Have some indoor fun by playing some Minute to Win It games (numerous game suggestions can be found online) and reward contestants with themed party gifts: an umbrella, rain boots, rain coats, flower seeds, gardening gloves/tools, etc. 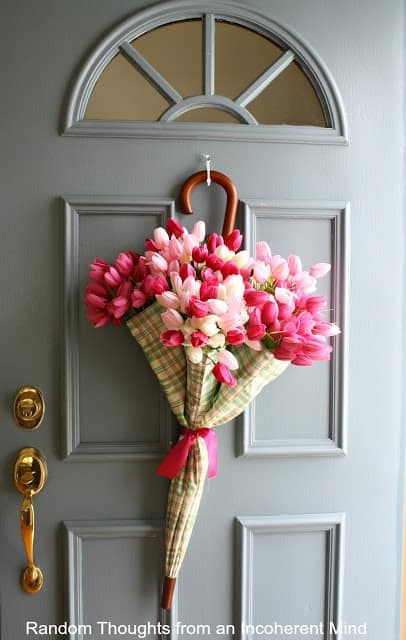 Send guests home with a candy filled umbrella, a bulb for a springs bloom or flower seeds.